Production runs have begun on Genis Holding LLC’s G225 LE compressor package. 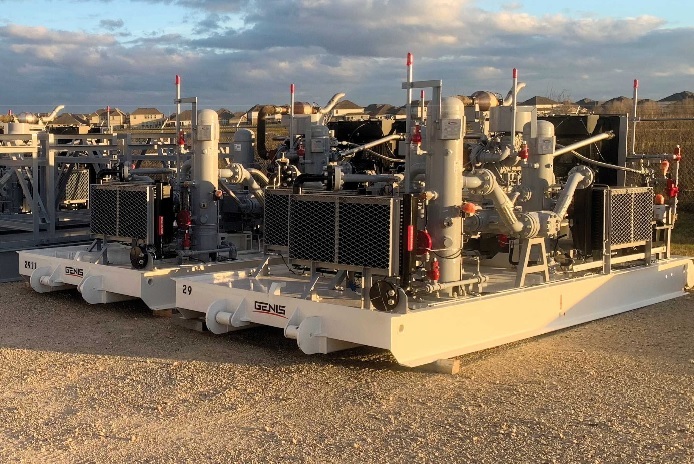 Nicknamed “The Mako,” it represents a step change in gas compression packaging and introduces the industry to a new compressor and cylinder design, a new engine, a patent-pending cooling system, a web-connected control system, and process gas piping. The Mako is comprised of a 228-hp (170-kW) engine driving an NG three-stage, two-throw balanced opposed compressor connected via a drive shaft, eliminating the traditional coupling for power transfer and many of the associated alignment issues. The G225 LE targets gas lift, injection, and gas gathering applications up to 1440 psig (992 bar). According to Hayden Manias, marketing and sales support manager for Genis, the initial testing of the prototype and the first commissioned LE units have shown approximately 5% lower BHP/MMCFD to comparable 200 class BHP sized equipment. “This all comes in a package weighing 27,000 lb. (12,247 kg) less than the competition — 15,000 vs. 40,000 lb. (6803 vs. 18,143 kg) — which means significantly lower costs to the owner,” said Manias. The G225 LE package utilizes a Power Solutions International (PSI) 11.1L-ACES configured inline 6-cylinder, EPA emission-compliant natural gas engine that is rated 228 hp at 1800 rpm for compression application. The engine can operate on variety of fuels including natural gas, propane, and wellhead gas. The Mako utilizes a patent-pending Fresco gas cooling system that is modular design, which helps to reduce the overall footprint of the package. This article appears in the April 2019 issue of Gas Compression Magazine.